The village of Kiltegan, Co Wicklow, came to a standstill as a steady stream of shuttle buses ferried hundreds of mourners to the funeral of local GAA legend and journalist Peter Keogh. The much-loved and respected president of Wicklow GAA and reporter with the 'Wicklow People' newspaper died aged 86 following a brief battle with cancer during which he continued to write his popular Keogh's Corner column. 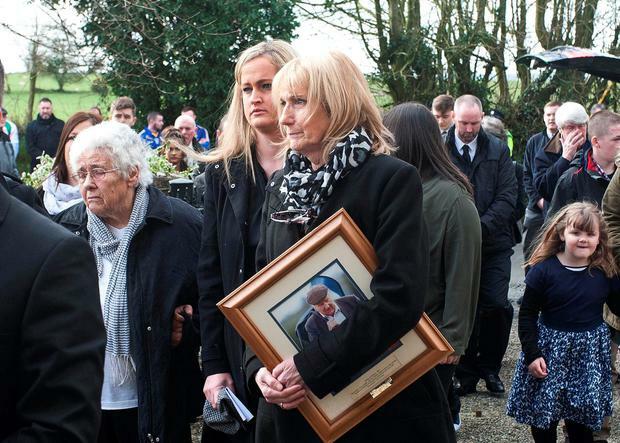 Some 500 mourners, including his sister Kathleen, daughters Josie and Breda, neighbours and GAA officials and members from across Ireland attended the celebration of his life yesterday. Renowned tenor Des Willoughby sang 'Amazing Grace' before he was laid to rest at Tynaclash cemetery. More than 2,000 people had attended his wake the night before. His close friend, Wicklow GAA county chairman Martin Coleman, said Mr Keogh "certainly was a legend" who "was loved on and off the pitch". "He was a once-off person. He had a great way of communicating," he said.